In Sir Ridley Scott’s Prometheus, a quasi-prequel to his 1979 blockbuster film, “Alien," an Earth-based crew is sent on a journey to a near-by star system to explore a planet believed to host an advanced civilization. The great question film asks is "Did aliens create the human race? If so, does that negate the existence of God? Or, did God create the aliens?" Prometheus centers on scientific exploration on board a spacefaring vessel named for the Titan in Greek mythology who stole fire from the gods and gave it to humans—and paid a terrible price for doing so. The Prometheus is following a star map found at various unrelated archeological sites on Earth, which leads the scientists to believe that the map may help them discover humanity's origins. A deeply religious “Prometheus” scientist Elizabeth Shaw (played by actress Noomi Rapace) discovers a series of mysterious symbols written inside a cave, that sets her on a intergalactic quest to prove her theory that humans were created by alien life forms. “The more you go into it, the more you realize that it kind of makes sense,” Scott told FoxNews.com. “You stand outside at night, you look at the galaxy, and think, ‘The fact that we think we’re the only ones here is entirely ridiculous.’ It’s an arrogance to believe that we’re the only ones here. “I absolutely think that religion will always be a part of humanity, because it was one of the first inventions of man. It doesn't matter how much faith you have or don't have, Scott told Esquire. "I just don't buy the idea that we're alone. There's got to be some form of life out there." The digital evolution could kill us in 50 years, says Scott. 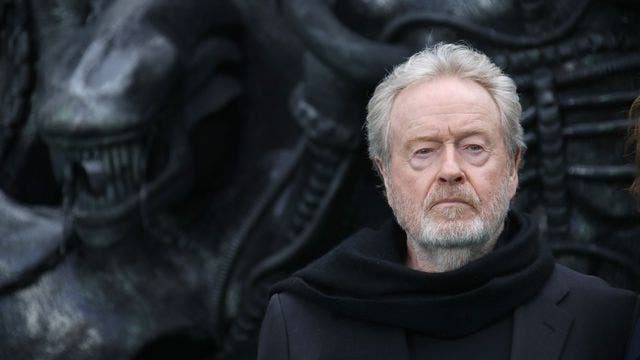 Speaking about Alien Covenant – which features several examples of fictional AI – Scott’s made his fascination with advanced technology crystal clear: “AI is much further advanced than they would care to discuss or admit,” he told Sky News. “The Wright brothers got off the ground for 25 feet in 1910. We’re now seriously considering landing on Mars 100 years later. That is shocking. But the digital evolution – from Steve Jobs forward – is quantum. It’s amazing what’s happening.